Highgarden Lemon Cakes by The Gluttonous Geek– These gorgeous little lemon cakes for inspired by Highgarden’s French asthetic. 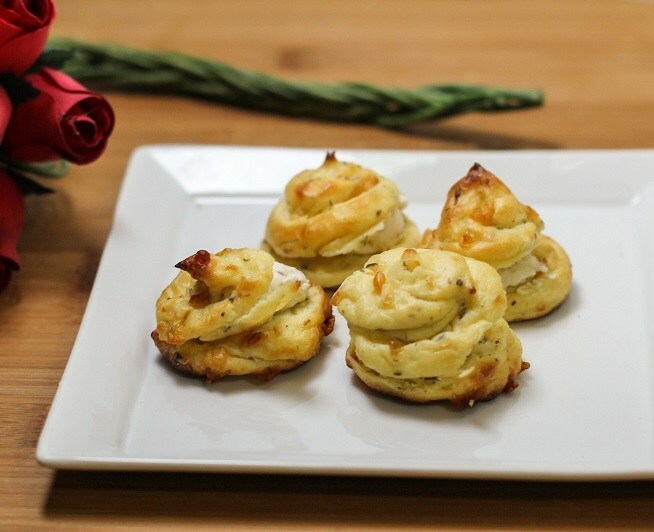 They mix a little sweet with a little savory and feature one of our favorite cheeses. Not only are they gorgeous and scrumptious looking, but they will also give you an excuse to learn how to make choux pastry. Red Velvet Dragonscale Cake by Liv for Cake– We are always jealous of people who are good at cake decorating. That is just so not our skill set. This cake was too beautiful to not include. The mixture of color in the frosting for the scales is simply stunning. 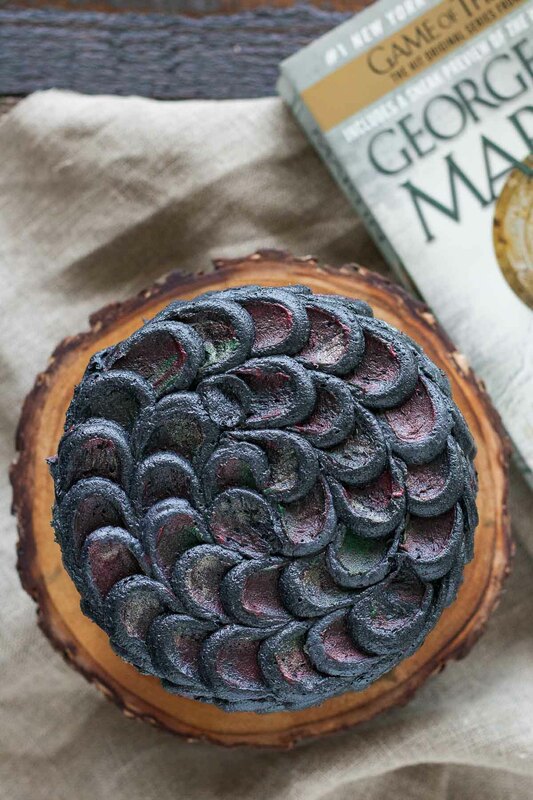 This cake is gorgeous enough that even the Targaryens would approve. 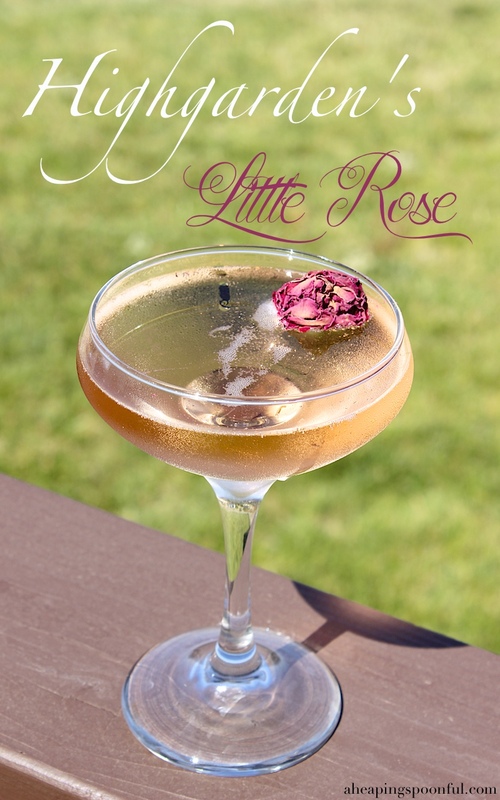 Highgarden’s Little Rose by A Heaping Spoonful– This recipe is literally Margaery Tyrell in cocktail form. Obviously rose for House Tyrell but there is more than meets the eye. The use of sparkling rosé also mimics her sweet but not too sweet personality. We may be a little biased as House Tyrell is our second favorite house, but we can’t wait to make this cocktail! 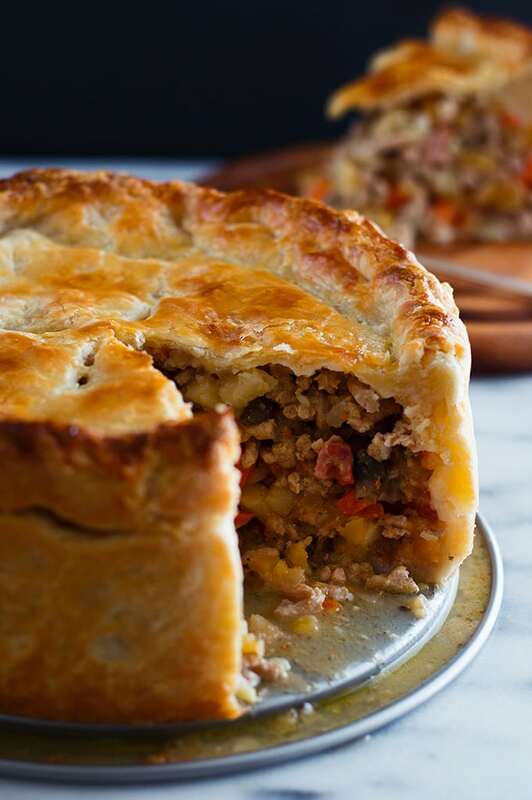 Frey Pie by Baking Mischief– Finally we’ve come to a savory dish to balance all of the sweet! This Frey Pie is a fair amount of work but the payoff is a stunning dish! It is loaded with meat and veggies galore. Just be sure not to lose a finger in it! 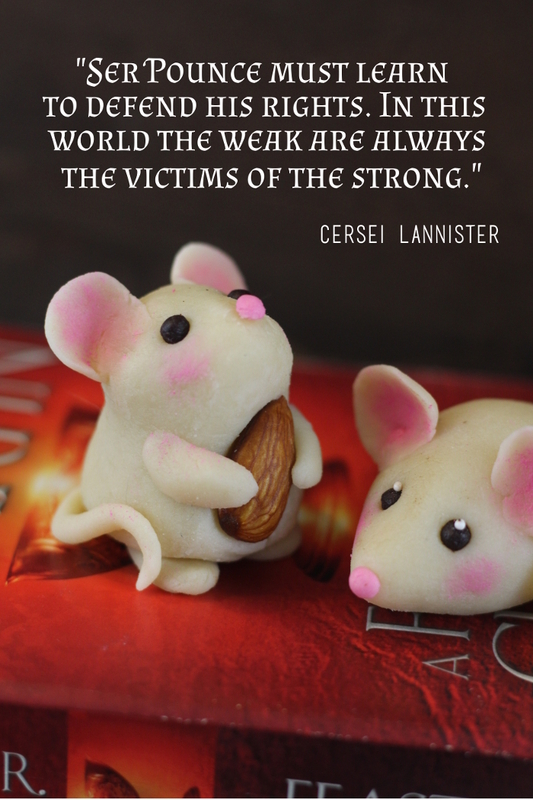 Marzipan Mice for Ser Pounce by Pretty Cake Machine– Have you ever made marzipan? Well we haven’t. In fact, if were being honest, it has never dawned on us to try. That is, until we saw these adorable mice! These marzipan mice are almost too cute to eat. Almost. We hope you’ve enjoyed this round up of Game of Throne inspired recipes! Do you have a Game of Thrones recipe to share? We’d love to see it! Share it in the comments below or us the hashtag #GeekEats! Well hubby (and my daughter) LOVE Game of Thrones. I know they would have fun with these tasty gems…and eat while they watch. Eat like a king! or like a King Wanna-Be! or just eat good food! I think these sort of theme dinners are such a fun way to entertain. Invite over the gang and turn on the show – then get down to business of eating and watching! This is a cool round up! I love the highgarden lemon cakes. I have always wanted to learn how to make choux pastry. It looks intimidating though! One day I will get to it. Oh. My. Gosh. These are so perfect! I wish I would’ve seen them during season 7 but I have plenty of time to plan ahead for 8.
oh my goodness. both my husband and bff are game of throne geeks. they would love this round up so much! What a fun roundup of recipes for the GoT fans out there…I know my kids would enjoy some of these. I might be one of those few who haven’t watched Game Of Thrones. But this round-up looks interesting. Especially the Dragonscale Cake. These are fun recipes for Binge watching! I love the Marzipan mouse. They look so cute. This is such a fun roundup to try recipes for the next GOT party. I’m loving the dragonscale red velvet cake n might try that soon. These recipe collections looks delicious red velvet cake and cocktail I would like to try it. It is ultimate treat for Game of thrones fans. This is really a great collection of recipes. Now I’m curious about Game of Thrones. I haven’t really been inspired to watch the show but these recipes changed my mind. What fun recipes! I just started watching Game of Thrones and can’t wait to catch up with all the episodes so I can get excited about premieres too.